A gold crown from Hwangnamdaechong National Treasure No. 191. A golden inner cap of a Silla crown from the sixth century. The crown jewels of Silla. This crown was excavated from Grave Six in Tillia Tepe, Afghanistan and is estimated to be from the first or second century. The style of the crown strongly suggests a Scytho-Iranian connection with Korea. The styling of the outer part of the crowns suggests a Korean connection with the Scytho-Iranians (Saka) and the people of the Eurasian steppe. The crowns are a uniquely Korean product and show no Chinese influence. The Silla crown is also notably distinct from the crown of Baekje, the crown of Gaya, and the crown of Goguryeo kingdoms. The tree motif of the crown is commonly believed to represent the idea of the world tree which was an important tenet of Siberian and Iranian shamanism. However, some believe that the trident-like protrusions symbolize mountains or even birds. Additionally, the antler-like prongs also indicate a strong connection to Korean Shamanism or the importance of the reindeer. A crown in Afghanistan (see image) bears a strong resemblance to the other Korean crowns which is also evidence of a Scytho-Iranian connection. Additionally, the sophisticated metalworking of the crowns show that Silla gold smiths held an advanced knowledge of working with gold. 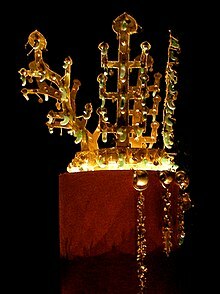 Some have even theorized that these advanced goldworking techniques, such as granulation and filigree, came from the Greek or the Etruscan people, especially because Silla tumuli also contain beads and glassware which came from as far away as the Mediterranean Sea. But researches and historical documents suggest a Persian connection or even origin. A crown of Silla made in 5-6th century exhibited at Musée Guimet in Paris. The delicate nature of the gold crowns comes from the fact they were made from cutting thin sheet gold. The crown is impractical to wear and some believe that the crown may have been made specifically as a burial good. The use of gogok, or comma-shaped curved jewels also point to an Iranian influence and the importance of the bear cult. [clarification needed] There may also be a connection with ancient Japan because the gogok were used extensively by the ruling elite of that society as well. These comma-shaped jewels of jade and glass may have symbolized the fruits and the bounty of trees. The use of many tiny gold mirrors dangling from the crown has led some to hypothesize that the crown, worn in sunlight, would be a dazzling spectacle reinforcing the tradition role of the Silla king as the symbolic representation of the sun on earth. The crowns come in two major parts. The inner part is a golden cap, which may have been covered in silk. This cap would sit within the band of the outer crown. There is a third part of the crown, namely the chains of gold with attached jade that may have been attached to the outer band. However, there is significant controversy over how the crown was supposed to be worn. Some believe that the three total parts were supposed to be worn together in one crown. However, the fact that the three parts of the crown have been found in three distinct areas of certain tombs, such as the Heavenly Horse Tomb suggests that the three objects are, in fact, three different types of crowns for different occasions. South Korea has officially designated some Silla crowns as national treasures (Hangul: 국 보; RR: gukbo), others as treasures (Hangul: 보 물; RR: bomul). The Gold Crown from Geumgwanchong (Hangul: 금관총 금관; Hanja: 金冠塚金冠; RR: Geumgwanchong geumgwan; MR: Kŭmgwanch'ong kŭmgwan) is the largest golden crown discovered. The Gold Crown Tomb (Geumgwanchong) was named after this treasure. It was designated as a national treasure on December 12, 1962. The crown is 44 centimeters in height and has a diameter of 19 centimeters. It is the largest golden crown from Silla discovered thus far. There are two parts to this crown. The outer band was discovered within the tomb while the inner cap was found outside of the tomb. The outer band consists of three tree-like branches which have three branches each. The Chinese character 出 chul is written three times on the hand band. Additionally, the outer head band also has two antler-like protrusions on the left and right side. All of the protrusions have jade and glass beads and tiny golden mirrors that dangle from the branches. On the sides of the headband also are two chains of gold with leaf-like decorations that end with jade jewels. These two chains hang below the head band. The inner crown is a triangle-shaped hat made of thin sheet gold and has two wing-like decorations on it. The wings are believed to relate to Korean shamanistic beliefs. The crown is now in the Gyeongju National Museum and is a masterpiece of Korean art. The Gold Crown from Cheonmachong (Hangul: 천마총 금관; Hanja: 天馬塚金冠; RR: Cheonmachong geumgwan; MR: Ch'ŏnmach'ong kŭmgwan) is currently housed in Gyeongju National Museum. The crown was designated as the 188th National Treasure of Korea on December 7, 1978. The crown was found in Cheonmachong (Tomb No. 155, also known as The Heavenly Horse Tomb) in 1973 and is believed to be the crown of King Soji or King Jijeung. The crown is 32.5 centimeters in height. There are three prongs forming the Chinese character 山 “mountain” on the front of the crown. There are also two prongs in the shape of a deer antler on the back. This crown also has two dangling chains of gold in the shape of leaves hanging from the end of the headband. Notably, the tree-like prongs of this crown have four branches instead of the more common used three branch motif. There is still controversy of how this crown was to be worn because of where it was found in the tomb in relation to the coffin. The Gold crown from Hwangnamdaechong(Hangul: 황남대총 북분 금관; Hanja: 皇南大塚北墳金冠; RR: Hwangnamdaechong bukbun geumgwan) is currently housed in the National Museum of Korea and is one of the most popular exhibits there, along with the two Bangasayusang. It is a National Treasure of Korea and was named as one on December 12, 1978. The height of the crown is 27.5 centimeters and the gold chains and pendants that dangle from the crown, known as Suhasik are 13 to 30.3 centimeters in length. The crown is known for its abundant use of jade. The Suhasik are grouped into two groups of three and are arranged with the longest chains on the outer edge to the smallest chains closest to the front of the crown. The Suhasik also hold blue jade and golden leaves on the end of the chains. There is still a controversy of whether the Suhasik are actually a part of the crown, namely because the Suhasik were found separate from the crown when excavated. The crown has three tree-like prongs with three branches each and also has two antler-like prongs on the left and right side of the main band. The tree-like prongs of the crown have been interpreted by some scholars as the Chinese character for “mountain”. Decorations of a deer antler are attached to the ends of the crown. 77 pieces of jade were adorned on the crown. Sixteen pieces of comma-shaped blue jade were attached to the Chinese characters, nine pieces of jade on the deer antler, and eleven pieces on the head girdle. This crown is particularly noted for its abundant use of jade. This crown may have been made for a queen and there is a significant controversy about who was buried in the tomb. This crown, known as Gold crown from Geumnyeongchong Tumulus (Hangul: 금령총 금관; Hanja: 金鈴塚金冠; RR: Geumnyeongchong geumgwan; MR: Kŭmnyŏngch'ong kŭmgwan), is currently housed at the National Museum of Korea. At 27 centimeters in heights and 15 centimeters in diameter, it is the smallest Silla crown discovered thus far, and the simplest. Like a typical Silla crown, it has five main prongs. The tree-like prongs, shaped like the Chinese character 出 chul, which means “going out”, are placed on the front and sides of the headband. The tree-like prongs have four branches each. There are two antler-like prongs which flank the two side tree-like prongs. Additionally, there are birds on top of each branch. On the upper and lower part of the surface are two-lined spot patterns made with a stamping technique. Hanging ornaments hang at the right and left side of the crown frame. This crown has the distinction of being the only gold crown made solely of gold without any jade accoutrements. The Gold crown from Seobongchong Tumulus (Hangul: 서봉총 금관; Hanja: 瑞鳳塚金冠; RR: Seobongchong geumgwan; MR: Sŏbongch'ong kŭmgwan) is a gold crown of Silla origin that is now housed at the Gyeongju National Museum. The crown is 30.7 centimeters in height, 18.4 centimeters in diameter, and 24.7 high when the ornaments hanging from the headband. There are five branches standing on the broad crown frame which is stamped with a wave pattern and stamped in a form of a dotted line. The headband is decorated with leaf-shapes and bent jade. The right and left most branches, along with the middle branches of the five branches, are composed of the Chinese character 出 in three prongs. The tips of the branches are decorated with a budding flower ornament. Two crossing gold belts having the tip on the each 4 dividing points of the crown frame, construct the inside framework. At the both sides of the crown frame, styled-earrings are dangling from the headband. The Silver crown (Hangul: 은관〈98호 남분〉; Hanja: 銀冠〈98號南墳〉; RR: eun(-)gwan (98[= gusippal]ho nambun); MR: ŭn'kwan (98[= kusippar]ho nambun)) from the south mound of Tumulus No. 98, is a silver crown and was found near the head of the body in the coffin of the tomb. 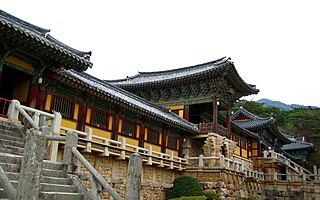 The crown is currently housed in Gyeongju National Museum. The measurements of the crown are: 17.2 centimeters in height, 16.6 centimeters in diameter, the width of the headband is 3.2 centimeters. The crown has three prongs but they are unique to any other kind of Silla crown discovered thus far. The center prong is thick and shaped like a shield or a perhaps a shape bent like a bow with a high middle section. There is a silver plate attached to this prong. On either side of the center prong is a crescent-shaped prong. The outer side of these crescent-shaped prongs are cut and twisted to make feather-like protrusions which are unique to Silla art. However, there is an analogous example of this feather-like embellishment from a crown of Gaya providence found at the Uiseongtamni Tumulus. The Eungwan crown was uncovered in Tumuli Park of Michu Royal Tomb in Gyeongju. The mound is connected from the north and south and so has the shape of a gourd. With a diameter of 80 meters from east to west and 120 meters from north to south, it is the largest mound of Silla. The south mound is 23 meters in height, the north mound, which is where National Treasure No. 191 was uncovered, is 22 meters in height. ^ a b c d Lee, Author: Soyoung. "Golden Treasures: The Royal Tombs of Silla – Essay – Heilbrunn Timeline of Art History – The Metropolitan Museum of Art". The Met’s Heilbrunn Timeline of Art History. ^ Kidder, J. Edward (1964). Early Japanese Art: The Great Tombs and Treasures. D Van Nostrand Company Inc. p. 105. ^ "Korea, 1–500 A.D. - Timeline of Art History – The Metropolitan Museum of Art". ^ "Display Detail Information". www.pennfamily.org. Daegaya was a city-state in the Gaya confederacy during the Korean Three Kingdoms period. Daegaya was located in present-day Goryeong County, in North Gyeongsang Province of South Korea. Jinpyeong of Silla was the 26th king of the Silla Dynasty, one of the Three Kingdoms of Korea. King Jinpyeong followed in the footsteps of his predecessor, King Jinji, by reorganizing the central ruling system of Silla. Upon the onset of a multitude of conflicts between Baekje and Goguryeo, he sent emissaries to improve relations and strengthen ties between Silla and the Chinese dynasties Sui and Tang. He is also known for his promotion of Buddhism as a spiritual guide for the kingdom and encouraging Buddhist teachings.